That's quite a collection of fruits ripe for the picking. The fruit basket has been overturned, and it’s up to you to set it to rights. But the goal is to do it as quickly as possible. Do you know your pineapple, kiwi, strawberries, and apples? Probably. But do you have a handle on pomegranates and figs? You won’t have much time to figure it out. Grab your tongs. It’s time to make some fruit salad. 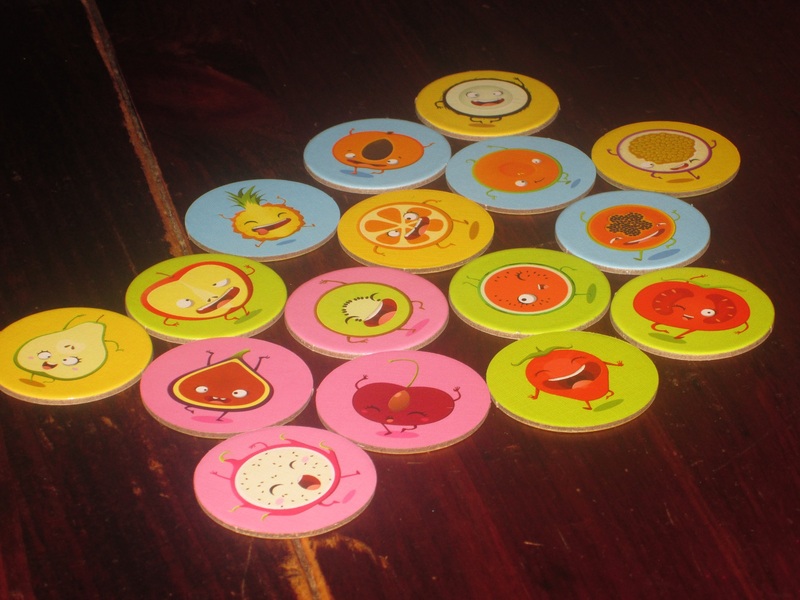 Tutti Frutti is a speed matching/recognition game for two to six players. 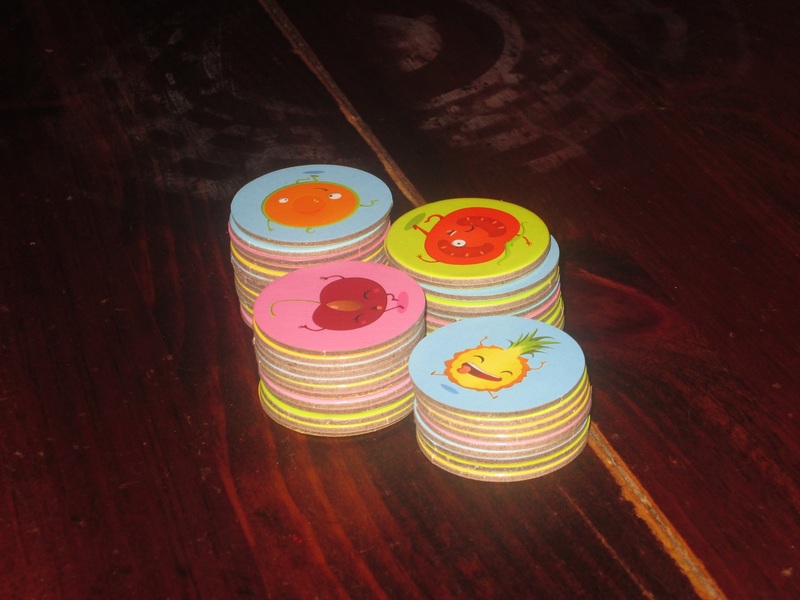 Players try to collect matches to the fruits on either end of their fruit stack. The player with the tallest stack at the end of the game wins. Tutti Frutti set up for four players. Yes, setup is essentially dumping the discs on the table. To begin, place the two-sided fruit discs in the center of the table. Each player takes one disc at random. When the game begins, players grab fruit discs simultaneously, trying to match either side of their starting disc. Once a match is found, the two matching sides are placed facing each other, and the player has a new fruit to try to match on the other side. 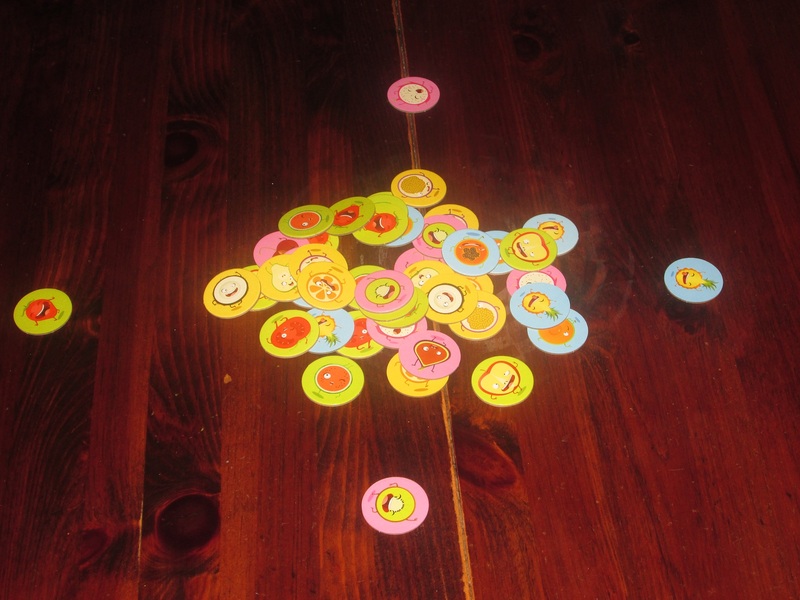 Players can flip any discs they want in the center of the table, trying to find the fruits they need to match either end of their stack. Play continues until either no discs remain in the center of the table or it is no longer possible to match any discs in the center of the table to players’ stacks. Players line up their stacks next to each other, and players verify that the tallest player stack is correct in its matches. If it is, that player wins. If not, players verify the next tallest, and so on. That’s quite a collection of fruits ripe for the picking. 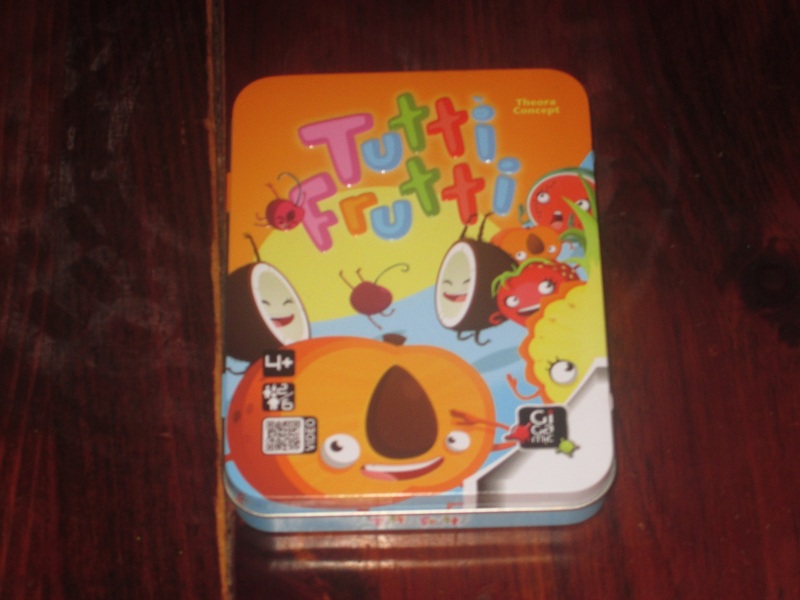 Tutti Frutti looks like a kid’s game. The cartoony fruits are cute and seem aimed to appeal to kids. The simple rules (a single spread in a tiny rulebook) bear this out. On its tin, it even advertises that it is for children as young as four, and this is pretty accurate (although my four-year-old doesn’t play nearly as well as my adult friends would be able to). Tutti Frutti definitely targets children as its primary audience, so it is no surprise that this is a game you will want to leave on your shelf at the adult game night. But for children, it strikes the right balance of package appeal and challenge that should make it fun–at least for children of similar skill. The tiles stack nicely together. These four stacks will be evaluated at the end of the game. But do they match? 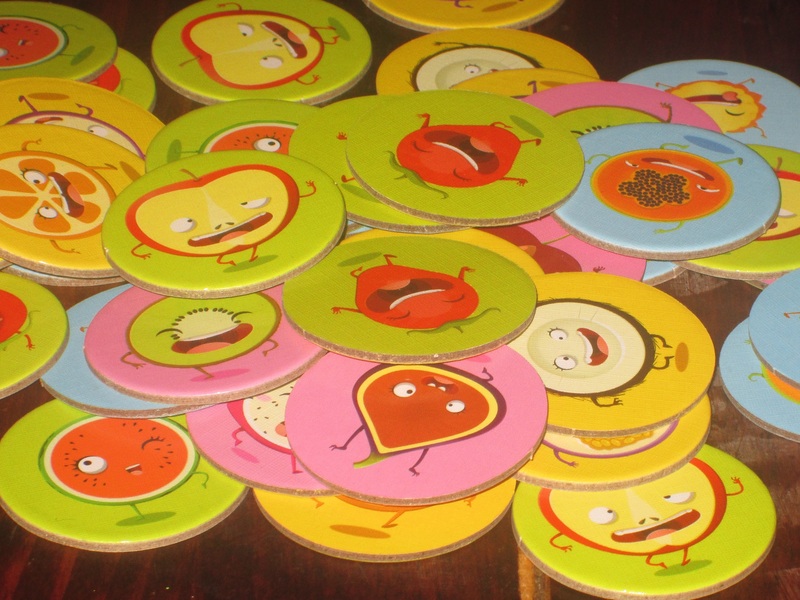 There are a few things that elevate Tutti Frutti above straight matching games. First is that the tiles used in the game are double-sided, which introduces a few wrinkles. It makes it so after players pick the easiest matches, they have to search for a new tile to add to their piles, and this is usually done by frantically upending the tiles on the table. It also makes for a fun and clever way for players to determine what they have to match next. Players can match either pole of their tile stack, so they have to hold two pieces of information in their minds simultaneously: what two pictures are fair game for them to find. This is harder than it seems, especially for young children who are trying to move quickly. The fruits chosen for the game are similar enough that, especially for young children, it might take a second to decide whether a match is legit. And the other thing that makes Tutti Frutti work so well is the fruits chosen to include in the game. The ingenious thing here is that many of the fruits look alike. With adults, this wrench rarely impedes the game. You move on with the speed you have, but you rarely have to stop and really consider. But playing with kids, I’ve found it’s a great way to teach them about subtle differences. The pear and the fig look a lot alike–but they’re not the same. The kiwi and the coconut are both circular, but they are different colors inside. I like that the matching element is more subtle than branded memory games, where it’s too easy to match characters. (Although, for some odd reason, every other engine on the Island of Sodor is blue. Go figure.) Here, at least with younger audiences, they have to work to find the matches. And the fruits included in the game are also well chosen because many of them aren’t common, at least not in the midwest United States. I look at them, and I don’t immediately recognize them. By choosing exotic fruits, it provides a learning opportunity for kids and adults to find out what the different fruits are. The rules are a single spread in a small rulebook. 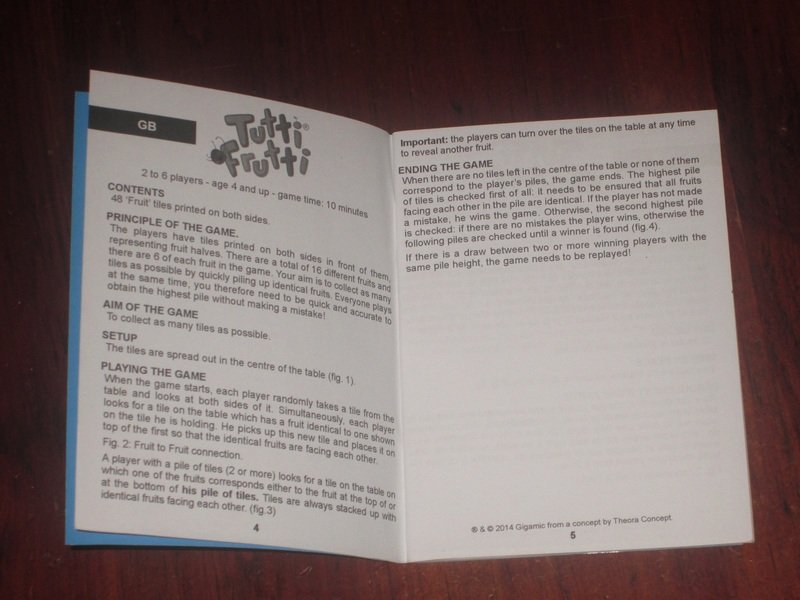 The rulebook is quite thick, though, because of all the languages included. As I mentioned, though, for adults, this is definitely one to play with the kids, which is not always the case with kids’ games. There are some games for children that I play more with my adult friends than with children, but Tutti Frutti isn’t one of them. Although it is a speed game, the challenge was simple enough that even besting opponents in a competition of speed wasn’t enough to make it something we wanted to play again and again. 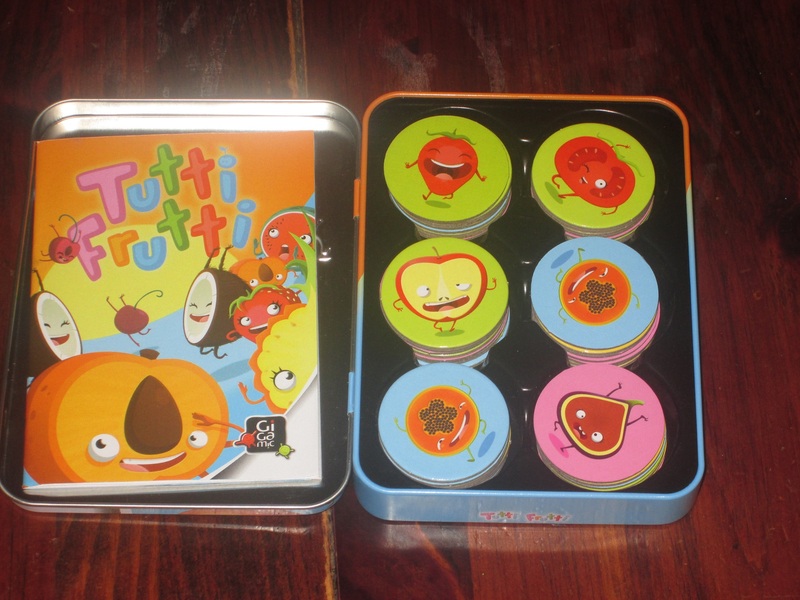 But with children–either as a learning activity or a light competitive game to play with the adults or as a game to play among other children–Tutti Frutti works very well. The tin and insert. The package is attractive and useful. The components in Tutti Frutti are excellent. The fruit artwork is well chosen, and the quality of the discs is good. The insert holds the stacks of discs well, and the tin has its lid attached on a hinge, so it’s easy to open and close. Some may not like the tin packaging because tins are hard to stack. I don’t mind this tin because it’s thinner than many, and I think it works well for the game. Tutti Frutti has a small footprint and an appealing package, and for its price, it’s a decent choice for a children’s game. It encourages light competition, and it’s a step up from typical matching games because it is a game of subtle differences. While it’s not something I’ll play with my adult friends who enjoy games, I plan to play it with my children, nieces, and nephews at gatherings this holiday season. It’s an ideal choice for that environment. iSlaytheDragon would like to thank Gigamic for providing us with a copy of Tutti Frutti for review. Speed challenge in the game should keep this interesting even beyond the early years of learning to match.